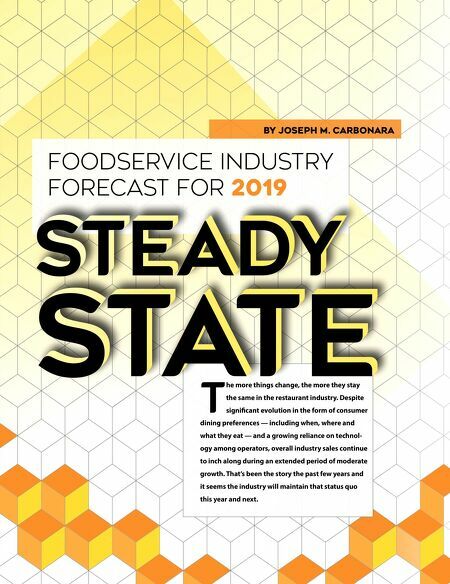 SEPTEMBER 2018 • FOODSERVICE EQUIPMENT & SUPPLIES • 23 Sales at restaurants will hit $825 billion in 2018, according to the National Restaurant Association (NRA). This represents 4 percent nominal growth or 1.4 percent in real terms. "2018 is the ninth consecutive year of sales growth for the restaurant industry," says Hudson Riehle, senior vice president of the research and knowledge group for the NRA. "Not surprisingly, it's another year charac- terized by moderate growth. When you look at the industry's compound annual growth rate since the associa- tion started tracking it in 1970, it's a solid 6.4 percent. However, if you look at it for the past decade, it drops down to 3.7 percent. There's definitely a period of moderate growth in the post-recession environment." A period of moderate growth is exactly what most industry observ- ers predicted heading into this year. "I think 2018 has gone to plan. I don't think there's anything that has changed dramatically," says Darren Tristano, a longtime industry analyst. "The idea for 2018 was we were going to see 3 percent to 4 percent growth and 2.5 percent of that was inflation- ary. So very real little growth. I don't expect very much change there." The restaurant industry's moderate growth rate reflects the overall moder- ate growth rate of the U.S. economy, Riehle notes. In fact, according to data from the U.S. Bureau of Economic Analysis, gross domestic product has exceeded a 3 percent growth rate all of 4 times over the past 16 quarters. This includes a 4.1 percent growth rate for the second quarter of this year. At the same time, the amount of money consumers have to spend on food continues to shrink. On aver- age, consumers spend 12 percent to 13 percent of their budget on food. "If you go back a few decades, what consumers spent on food was consid- erably higher," Riehle notes. The good news is that roughly half the money consumers spend on food goes to restaurants, he adds. But restaurants can't continue to live off a healthy bite of a shrinking pie. This will force operators to get creative as they look to acquire and retain customers. "Going forward you are going to see more consum- ers linking restaurant spending with other categories," Riehle predicts. He points to the grocery segment as one example. Many grocers now entice shoppers by offering them discounts on their gasoline purchases. Another example is the way some financial services companies offer to lower insur- ance premiums for customers who purchase perceived healthy food. "You will see operators bundling restaurant spending with other necessary spending," he adds. In addition, restaurants may start leveraging technology to drive sales. For example, digital menu boards make it easier for restaurants to alter pricing based on daypart and other factors. It's interesting to note that this approach seems to resonate with consumers. "When you ask consum- ers, roughly three out of four say they would patronize restaurants more if they could get different pricing from restaurants," Riehle adds. Emerging consumer groups such as Millennials and Generation Zers learned some valuable lessons during the last recession, and it shapes how they use restaurants. For example, they understand the need to man- age their finances, including paying down debt such as student loans, but are finding ways to balance that with their desire to eat out as much as possible. "It's trying to manage the cost so they can dine out with greater frequency," Tristano says. "The mindset is ' "I am going to dine out as often as possible but take advantage of a deal, whether it's a coupon, an incentive for checking in via social media or an app and other ways.' " The whole concept of restaurant pricing could be ripe for change. "If you think about how restaurant meals are paid for it has not changed in 100 years," Riehle says. They either pay right before or after their purchase. Younger con- sumers are more apt to like a Netflix- like subscription approach." For the foreseeable future, though, labor will remain a multifront battle for operators. In a very labor-inten- sive industry, operators continue to struggle with employee recruitment, retention and even cost. "Roughly one out of every two restaurant operators reports their top challenge is labor related," Riehle notes. "It can vary by region and even within states by certain metropolitan areas." 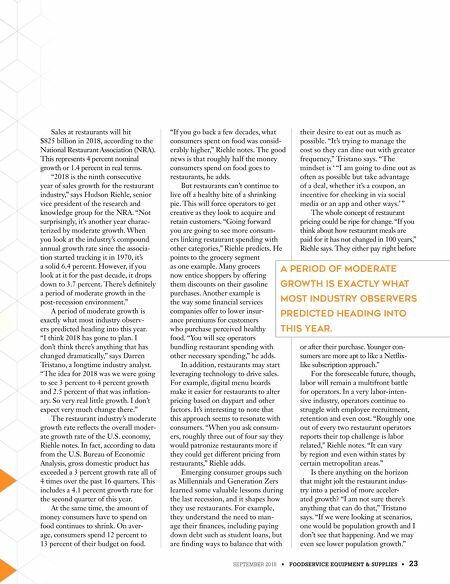 Is there anything on the horizon that might jolt the restaurant indus- try into a period of more acceler- ated growth? "I am not sure there's anything that can do that," Tristano says. "If we were looking at scenarios, one would be population growth and I don't see that happening. And we may even see lower population growth." A period of moderate growth is exactly what most industry observers predicted heading into this year.